CARBONDALE, Ill. – We often hear disasters such as hurricanes, tornadoes and earthquakes referred to as “natural disasters,” as humans don’t cause them the way they might cause a chemical spill. But for anthropologists, calling something a natural disaster is a bit of a misnomer. It’s only a “disaster” if humans are impacted, for one thing, and humans have very different perceptions of the causes and effects of such events, as well. In that way, the aftermath of such events can reveal a lot about who we are, if you ask the right questions. A researcher at Southern Illinois University Carbondale is using a grant from the National Science Foundation to find out more about how people recovering from Hurricane Harvey have interpreted the event, as well what they think are the best ways to prepare for and prevent such calamity in the future. Roberto Barrios, associate professor in the Department of Anthropology, hopes a cross-section of Houston locals, including residents, civil society leaders and local government officials, will reveal the various ways they understand the disaster and explain what is at stake in terms of long-term recovery from Harvey, which hit Texas in late August of last year. Barrios, along with a colleague from the University of Tennessee Knoxville, received the $78,000 NSF grant in 2017 for the project titled "Changing perceptions of causes and consequences in the immediate aftermath of a disaster.” The funding runs until mid-October this year. The grant also is paying dividends in terms of SIU’s strong commitment to undergraduate research. Grace Vargas, a senior earning a degree in anthropology, recently received a Cultural Anthropology Research Experience for Undergraduates supplemental grant from the NSF. Vargas will help Barrios with the research in three Houston neighborhoods. Vargas said she feels truly fortunate for the opportunity, and the process of writing the grant proposal has informed and changed her thinking about course material as a student. Barrios said disasters such as Harvey disrupt the way humans develop their society and use land. “Consequently, we believe the term natural disasters is a misnomer, as all disasters occur at the intersection of society and the environment,” Barrios said. For some anthropologists, Barrios said, a disaster is a “revelatory crisis” that provides a way of evaluating which development practices used by humans are conducive to long-term adaptation and sustainability, as well as those that are not. “The revelatory quality of disasters, however, is contingent on the observer having an anthropologically informed perspective on disasters,” he said. Barrios and his colleagues believe what a disaster reveals to various members of a society varies from one observer to another, depending on their socioeconomic status and their vantage point. It also might vary based on how each person visualizes the policies and practices necessary to recover from and mitigate a disaster. “We want to see how the members of these various social groups understand the disaster's causes, and what they think are necessary actions to reduce the probability of a similar disaster occurring in the future, as well as how to best recover from this recent calamity,” Barrios said. Communities with histories of socioeconomic marginalization often are quite sensitive to outsiders asking questions. It can be a challenge to develop the trust and rapport needed to elicit in-depth conversations that yield good, usable data and information in such cases. Barrios conducted an initial round of field work in October, returning in January and March as well. He plans longer trips in June and July, as well as weeklong trip in October of this year. The researchers will address questions such as what did Hurricane Harvey reveal for you? Why do you think the rains of this hurricane triggered a catastrophic event in Houston? What policies and practices do you think are necessary to rebuild the city and prevent or mitigate similar disasters in the future? “This is a qualitative study, so it is not a large sample, but we hope to develop a profound understanding of each (person’s) interpretation and experience of the disaster,” he said. “To understand why Hurricane Harvey manifested in the way it did, we have to understand the way the urban landscape of Houston developed in the way it did since the 1950s and the relationship of this growth to petro-chemical production,” for instance, Barrios said. -SIU Anthropologist Roberto Barrios received a grant from the National Science Foundation to study social after-effects of Hurricane Harvey in Texas. 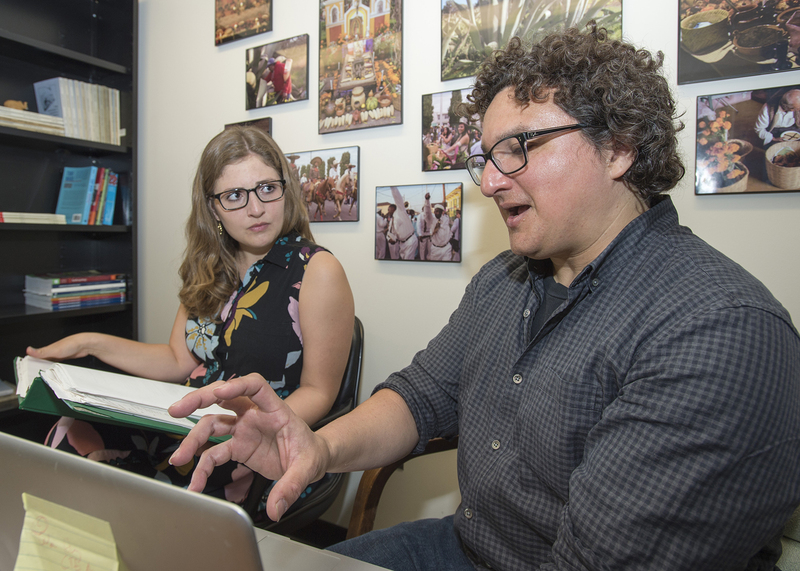 - Grace Vargas, a senior earning a degree in anthropology, recently received a Cultural Anthropology Research Experience for Undergraduates supplemental grant from the NSF. Vargas will help Barrios with the research in three Houston neighborhoods. -The work is already under way and will conclude this October.